Join the chamber! In addition to monthly evening networking opportunities, there are several breakfasts where you can meet fellow members and promote your business. New voices are welcome and vital to the relevancy of our chamber of commerce. Participation in seasonal events is another way to be involved. What a great welcome last night. I am so glad to be part of this dynamic group. I hope this will truly become a community project. Happy to have finally met! Loved your Facebook post this morning on us – THANKS! I am SO GLAD we joined the Chamber!!! 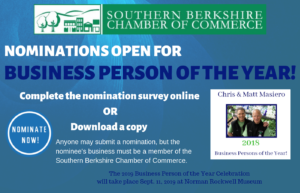 You can’t get better “bang for your buck” than as a Southern Berkshire Chamber of Commerce Member. Just the opportunity to promote yourself in the weekly Email blast alone is worth the membership fee. I recommend Chamber membership to all nonprofits as a way to raise awareness of their missions and develop relationships with our business community members. My first visit to the Southern Berkshire Chamber of Commerce office was like a pleasurable journey back in time — that is to say, before the advent of the phrase, “In A New York Minute”. Betsy and Laurie greeted me warmly and shared their knowledge and wisdom regarding commencing a small business in Berkshire County — they immediately made me feel welcome. Betsy provided numerous insights which continue to act as a guiding light in operating a Human Resources Advisory dedicated to serving small- and medium-size organizations. Additionally, Laurie has assisted me tirelessly with digital communications and helpful hints for marketing the services of High Peak Partners. I view the Chamber as a business partner with the willingness to go the extra mile in support of a new member. Hats off to Betsy and Laurie — friends and neighbors of mine at 40 Railroad Street.